Drinking games! With beer pong championships awarding winners cash prizes of $50k and more, it might not be a bad idea to get yourself a table and start practicing. Check out what this guy can do! When he is on his game, he is unbeatable force. This is how good you are going to want to get! 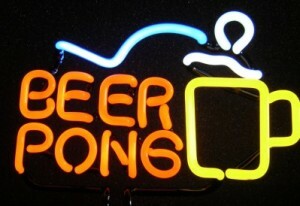 To find the perfect beer pong table just for you, check out this selection of beer pong tables! This entry was posted in Beer, Drinking, Drinking Games and tagged beer pong, drinking games by Stan Schubridge. Bookmark the permalink.